We can’t all escape to a cave to gaze at our navels all week in silent contemplation. That’s the trouble – we can’t get away from life itself with its daily frustrations and setbacks. It’s what takes away our peace of mind. The fact that we have a burning desire for certain things means that we are likely to feel tense or angry if anything turns up to prevent us having them. According to the spiritual philosopher Emanuel Swedenborg, there are basically three kinds of things we love and so when these are threatened or lost, there are three ways peace of mind can allude us. Firstly, everyone is concerned to some extent for self and so we all feel uneasy when what we need is under threat. Who doesn’t want a secure livelihood and so get angry when losing their job during a recession? We feel anxious if there is a risk to our social status and the good regard of others. Anxiety arises when health is threatened by illness. Secondly, one can be concerned for others and feel worried for their sake. The media reflect a widespread horror at the plight of starving people in an overseas famine and those suffering destruction of their homes due to a natural disaster. Our hearts go out to them and we feel disturbed by the pictures we see on the television news. Thirdly, we love what we value as good and true. How such values cause distress is more difficult to spot. But we know how up-tight people can get when their favourite work of art, political stance, or religious belief is under threat. Don’t we feel guilty if we go against our own values and principles or uncomfortable if they are undermined by what others say? Unease, anxiety, worry, horror, disturbance, distress, feeling uptight, guilty feelings and discomfort all take away peace of mind. These feelings derive from what we love. Get what we love in the right order then our fears gain a higher perspective. There is an ancient Taoist parable that tells of an old man and his son who lived alone in poor conditions. Their only possession of value was a horse. One day, the horse ran away. The neighbours came by to offer sympathy, telling the old man how unlucky he was. `How do you know?’ asked the old man. The following day the horse returned, bringing with it several wild horses, which the old man and his son locked inside their gate. This time the neighbours hurried over to congratulate the old man on his good fortune. `How do you know?’ asked the old man. The next thing that happened was that his son tried to ride one of the wild horses but fell off and broke his leg. The neighbours were quick to tell the old man that this was a disastrous turn of events. `How do you know?’ asked the old man. Soon after, the army came through, press-ganging young men into service to fight a battle far away. All the local young men were taken – except the old man’s son, because his leg was broken. The old man had peace of mind. A deeper kind of reflection less attached to the things of the world opens the interiors of the mind. But fear and anger close them. Being too tied to what is going on around us makes it difficult to assess from our limited perspective whether an event is good or bad. A young woman patient of Carl Gustav Jung’s was proving very difficult to help in therapy because she was keeping her personal feelings to herself only conversing on an intellectual level. She had had a dream in which someone had given her a golden scarab – a costly piece of jewellery. While she was telling Jung about this dream, he heard something behind him gently tapping on the window. He turned round and saw that it was a large flying insect knocking against the window-pane in an apparent effort to get into the dark room. This seemed to him to be very strange. He opened the window immediately and caught the insect in the air as it flew in. 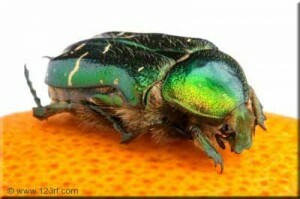 It was a scarabaeid beetle (Cetonia aurata) whose gold-green colour most nearly resembles that of a golden scarab. He handed it to his patient with the words, “Here is your scarab.” This moving experience broke the ice of her intellectual resistance and we are told treatment continued with satisfactory results. Carl Jung gives this as an example of what he calls `synchronicity’. This notion was his answer to the puzzle of why people sometimes experience meaningful coincidences in their lives that are inexplicable and apparently not due to what might be expected from chance. At first sight this sounds a bit like the magical beliefs of so-called primitive people for whom no accident, change in the weather or the health of the villagers is ever thought to be attributable to natural causes. Everything is somehow due to magical influence. Jung does not go this far. Nevertheless, he does say that synchronicity is one of the things that influences our lives as well along with natural causes. It is relevant when we are trying to fathom our experience of any purposeful trends in our affairs. The synchronous experience is said to occur when two kinds of reality (i.e. the inner and outer) intersect. I think we can be more specific regarding such experiences. Swedenborg writes that there is a divine providence that is quietly looking after our deepest needs. It hides itself but we might detect it when later we notice things working out for the best. Only later, if we reflect on what has happened to us, may we possibly comprehend that various separate strands of our life have been knit together. For example, we might later appreciate how we have been nurtured deep down, how the mess and muddle we make of our own lives has been cleaned up, and how new and interesting paths for us to follow have been illuminated. I feel attracted to the idea that we experience peace of mind when we never allow ourselves to trust in our own intelligence but instead contentedly allow ourselves to be carried along in the `stream of divine providence’ making the best of our opportunities. For when self-orientation no longer rules our hearts, then we rise above our worries concerning the transient things of the world and instead come to rely on the things of divine spirit. Next Next post: Money – What attitude to take to it?